Head Coach Kevin Parrish has today confirmed that club captain Anthony Leone will not be returning to the Dynamos for the 2015/16 campaign and paid tribute to a skater he describes as ‘an absolute pleasure to work with’. 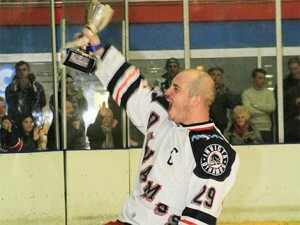 Anthony Leone first donned a Mos jersey in September 2006 and, but for two seasons with the Romford Raiders between 2010 and 2012, has been ever present in Gillingham since. In the last two campaigns he has led the side as captain and lifted the NIHL Southern Cup in April as the Dynamos overcame the Chelmsford Chieftains on home ice to claim their first silverware in five seasons. Now, after 302 appearances for the Mos, the forward will leave the team as the club’s tenth highest points’ scorer in history with a tally of 260 following 132 goals and 128 assists. Speaking on the departure of Anthony Leone, Head Coach Kevin Parrish said. “It has been a tough decision for Anthony to make as he has been very loyal to this club over his seven years in Kent and he’s one player I didn’t want to see leave this summer. He has been an absolute pleasure to work with, especially over the last few seasons as he took on the captaincy and made it his own. Anthony is a great leader, has been a great servant of the Dynamos and we wish him well for the future”. The departure of Anthony Leone will see a new look Invicta Dynamos take to the ice for 2015/16 with Callum Fowler also switching to the EPL’s Bracknell Bees and Juraj Huska joining rivals Chelmsford. News of incomings at the club are to begin shortly as Head Coach Kevin Parrish begins to mould his new look side ahead of the September start.